Sunday 6 March we received the sad news that our honorary guest conductor, Nikolaus Harnoncourt, has died. Our thoughts are with his wife Alice Harnoncourt and his family. Upon leading the Royal Concertgebouw Orchestra in Beethoven’s Missa solemnis in April 2012, Harnoncourt said in an interview with the Dutch daily NRC Handelsblad, ‘This is probably the last time. There are no new plans and no plans yet to make any.’ Scarcely two months later, though, he announced that he wished to return one last time. In October 2013, he bid his final farewell to the orchestra with a typically unorthodox performance of Bruckner’s Fifth Symphony, the recording of which appeared on an RCO Live dvd. 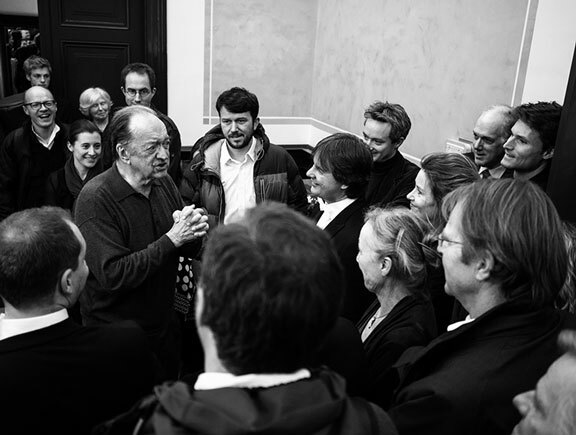 Harnoncourt was a conductor of great authority and a leading pioneer in the field of historically informed performance practice. Together with his wife Alice, he founded the Concentus Musicus Wien, which since 1957 has given countless performances and made many successful recordings, including the complete Bach cantatas with Gustav Leonhardt. He first appeared with the Concertgebouw Orchestra in 1975 conducting Bach’s St John Passion. The St Matthew Passion followed a year later. His interpretations have made an important contribution to the orchestra’s Passion tradition. Harnoncourt led a number of spectacular opera productions in Amsterdam, including the Mozart–Da Ponte operas. Over the years, he steadily expanded his repertoire of Haydn, Mozart, Beethoven and Schubert to include Schumann, Brahms, Dvořák, Smetana, Bruckner and even such composers as Berg and Gershwin. He was appointed honorary guest conductor of the Royal Concertgebouw Orchestra in October 2000. Harnoncourt was also a well-loved guest conductor with the Berlin Philharmonic Orchestra, the Vienna Philharmonic Orchestra and the Chamber Orchestra of Europe. He conducted opera performances at the leading opera houses of Milan, Zurich and Vienna. Harnoncourt also remained involved with his very own Concentus Musicus right up until his death. His recordings with the Concertgebouw Orchestra include Haydn’s last twelve symphonies, Mozart’s Le nozze di Figaro and the complete Schubert symphonies. Many of these recordings have won awards. Harnoncourt himself won the Erasmus Prize in 1980. He was made a Knight of the Order of the Lion of the Netherlands in December 2006 for his contribution to Dutch musical life in general and to the Royal Concertgebouw Orchestra in particular.